The Sherwood Development kit is a Highly Integrated Multi-core ARMv7 based SOC development/evaluation platform based on the high performance Marvell’s Armada XP MV78460 ARMv7 Quad core with integrated 2MB L2 cache that can runup to 1.6 GHz. 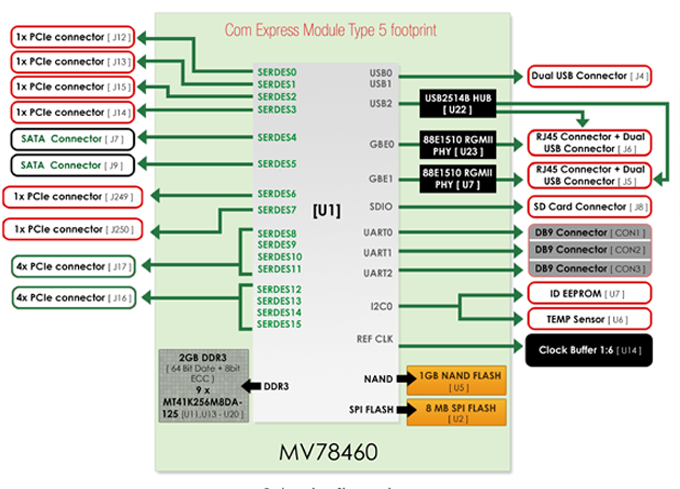 The module comes as a complete development kit, including a carrier card offering access to the various SoC interfaces. The system enables users to design and develop innovative embedded products based on Marvell's MV78460 processor. The system has 2GB (256M x8) DDR3 RAM and 4GB NAND Flash. The System can be used by developers as is, or Pactron can provide customized industrial designs, hardware and software for your specific needs. Pactron designs and develops comprehensive and robust embedded systems that provide storage, wireless, mobile, networked, audio video, and Internet-connectivity for OEM markets. Pactron delivers integrated hardware and software platforms that are incorporated into end-to-end solutions, providing its customers minimized risk, accelerated time-to-market, reduced development costs, and enhanced design architecture.